If you’ve been reading Object of the Day blogs you have probably read past articles on bandboxes. Popular in the United States from around 1800-1850, these were made of pasteboard and covered with either a wallpaper or a specially printed bandbox paper. The original intent was to store and transport men’s collar bands, but soon evolved and began serving as hat boxes and general carryalls. 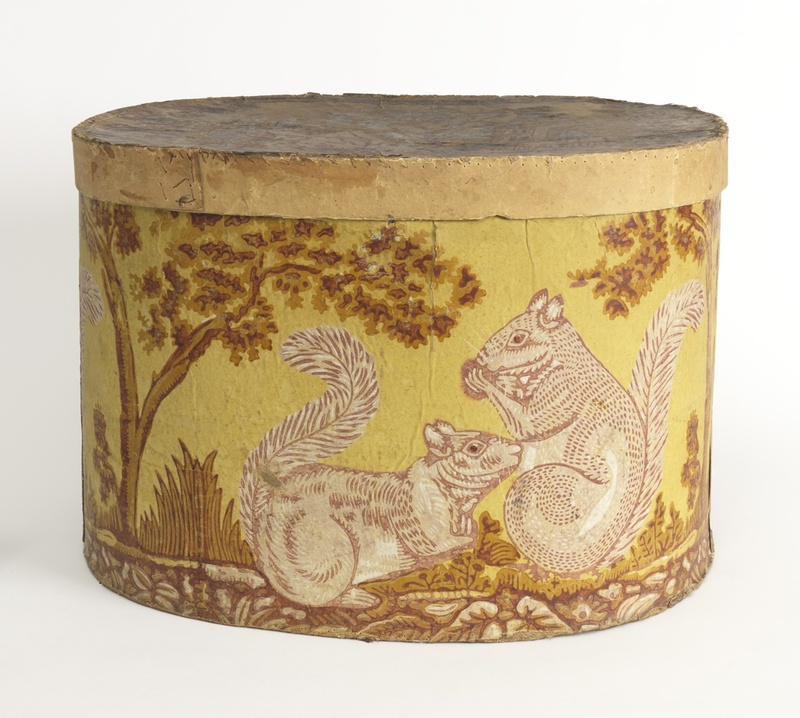 The boxes of greatest historical interest were produced in the 1830s, with many containing scenes of historical interest such as innovations in transportation and entertainment venues. So when I came across this box with a pair of squirrels I was perplexed. A little research revealed that while squirrels are indigenous to North America and were quite predominant across the eastern United States in the early 1800s, urban growth and dwindling trees made squirrels a rarity in American cities by the mid-nineteenth century. On the chance occasion when a squirrel was spotted it quickly attracted crowds of people, fascinated by its antics. Squirrels were said to add beauty and interest to city life, and were seen as a way to help city dwellers reconnect with nature. Recognizing the importance of green spaces within the urban environment, cities began shipping squirrels into city parks to encourage greater resident participation, and to help beautify and enliven these oases. In 1847 Philadelphia shipped three squirrels to Franklin Square, one of the original public parks in downtown Philadelphia, and provided them with food and shelter. In 1877 New York City imported a few dozen pairs of squirrels to Central Park, supplied them with houses, and even handed out bags of peanuts to visitors to encourage feeding. It is hard to imagine a place like Central Park without squirrels. Not only do they entertain people but dogs as well. Needless to say these squirrel populations have flourished and today environmentalists have the opposite problem, looking for natural ways to control these populations.